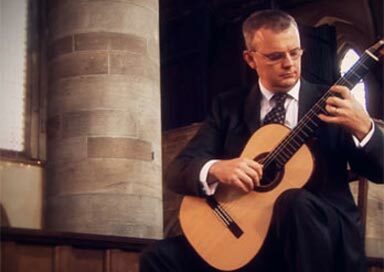 This Yorkshire guitarist has been performing for over 25 years and has a wide repertoire of pieces perfectly suited to enhance and entertain at any occasion. This guitarist began playing the guitar at 17 under the tutelage of Dr Melvyn Willen in his native Essex. In 1989 he moved to Leeds to study for a degree in music. 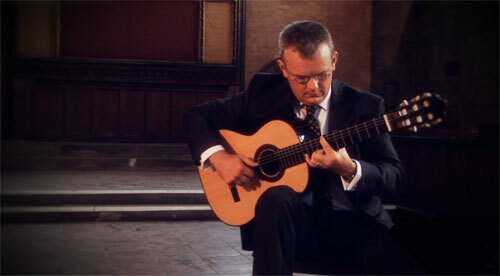 There, under the world-renowned guitarist Graham Wade, he was awarded the Leeds College of Music prize for most accomplished classical guitarist in his year. His first study and passion continues to be the classical guitar and since graduation he has played in numerous bands and ensembles including The Yorkshire Guitar Ensemble which he founded and directed. This last successfully raised much needed funds for St Martins House Children's Hospice from 1999-2006. He has taught over a thousand guitar students - both classical and electric - from beginner through to grade 8 and beyond. (Everything I do) I do it for you, Bryan Adams, co-written with Michael Kamen and Robert John Lange.